Sci-fi Lullaby is a solo show of Machiko Edmondson’s new work. 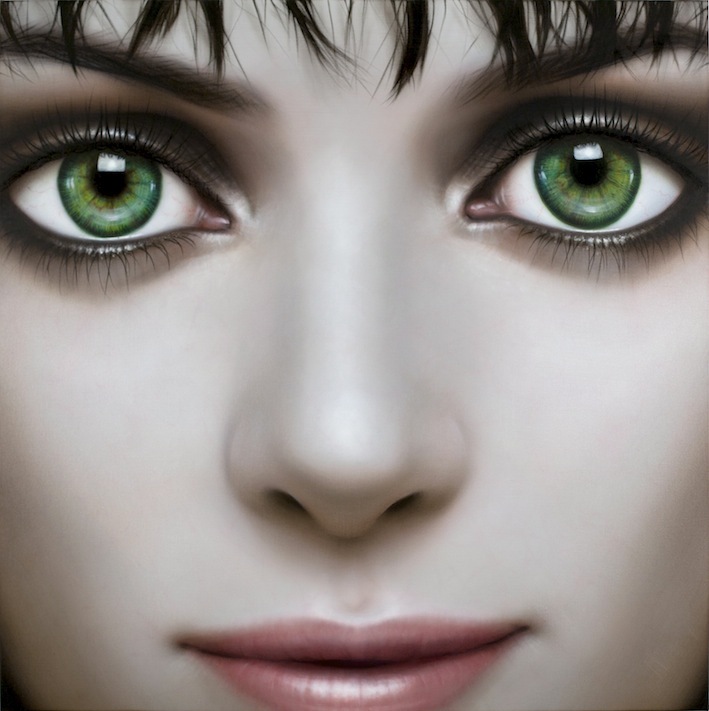 With influences from Baudrillard to Buffy the Vampire Slayer, Machiko Edmondson’s hyperrealist paintings − which she calls ‘anti-portraits’ − are literally out of this world. The new canvases, to be shown at Great Western Studios, mark a return to London from a four year stint living in NYC. Now working in a smaller studio space, the most recent paintings are smaller in scale than the earlier six-foot-square pieces, but no less intense. Exquisitely executed, gothic in feel, the close-up androidal faces look out supernaturally, as if inviting you to join a strange game. A black cat appears like a witch’s familiar on a shoulder. A blunted fingernail suggests a murder victim or, less darkly, a Manhattan manicure. Edmondson channels her superlative gift for the traditional art of oil painting into the postmodern era. Influenced by Baudrillard’s works on the simulacrum (i.e. a copy without an original), she creates a parallel reality of her own. The foolproof, as-if-computerized, almost Stepford Wives beauty of the subjects is not a mere exercise in realism. These females are flawless. Their gigantified eyes reflect something other than reality. Her method is perfectionist. Edmondson works for months on a single piece, − the large works take at least four months to complete − sometimes painting late into the night, with a single bristle left on the brush, in order to finalize the immaculate detail. Underlying the iridescent sheen is anxiety and obsession. Music and counterculture are an early love and motivating force for Edmondson. After seeing Robert Mapplethorpe’s album cover for Patti Smith’s Horses as a teenager, she left her native Japan for London where she studied art at Camberwell and Goldsmiths. In the 1980s, she stayed with the art-anarchist punk rock band Crass at Dial House, an open community near Epping in Essex. Bjork was another visitor. Some of her earlier exhibitions have featured portraits of the cult musicians Nick Cave and PJ Harvey. The title of the show, Sci-fi Lullaby, is taken from a song lyric by the brit-pop group Suede. The song itself, written by Brett Anderson, was inspired by William Blake, and written in a trance-like state. The exhibition runs from Oct 8 to 13 from 9am to 6pm, or by appointment with the artist, with a private view on Oct 10 from 6pm until 8pm. 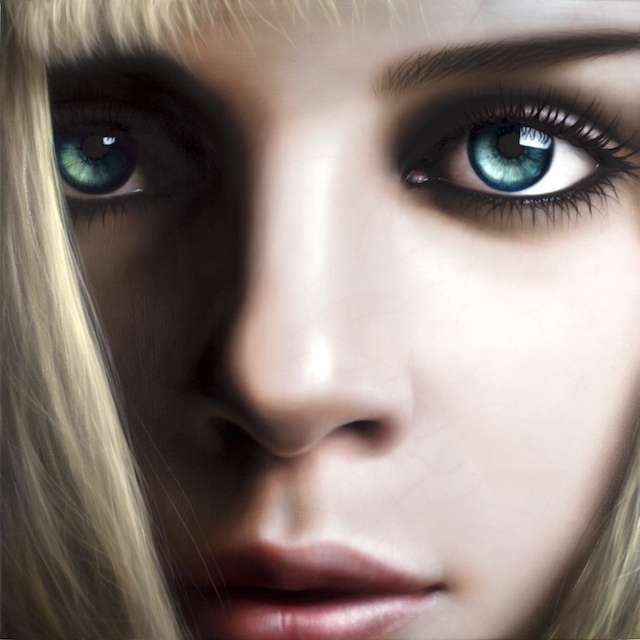 This entry was posted on 3 October, 2013 in homepage and tagged Baudrillard, Buffy the Vampire Slayer, Great Western Studios, hyperreal painting, Julie Goldsmith, Machiko Edmondson, Sci-fi Lullaby. Bookmark the permalink.